It’s almost a Christmas tree. Hail Santa! Looks like we’re not going to have to wait until season two to get more of Chilling Adventures of Sabrina. Creator Roberto Aguirre-Sacasa has announced that the series is getting a surprise holiday special next month. 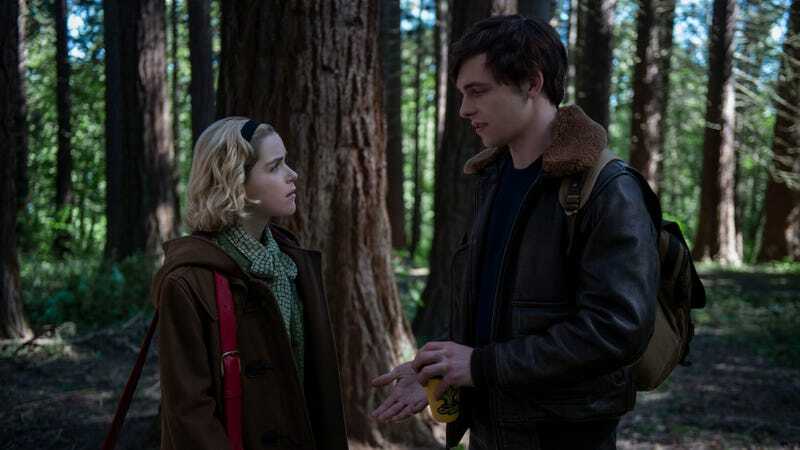 Aguirre-Sacasa revealed the news on Twitter that Chilling Adventures of Sabrina would be decking the devilish halls and filling the stockings with lumps of hellfire-smoked coal. The special Solstice episode, called “A Midwinter’s Tale,” arrives on Netflix December 14—one week before this year’s actual winter solstice, for the record. As a fan of the original holiday specials on Sabrina The Teenage Witch, let’s just say I was super ecstatic for this news. Of course, I’m guessing Chilling Adventure’s forays into the Most Wonderful Time of the Year won’t include things like Salem getting kidnapped by a kid who loves Neil Diamond, or Sabrina visiting a “cool teen club” for anti-holiday witches, inadvertently erasing Christmas from the face of the Earth (RIP “Bobunk”). But I’m excited to add another bewitching holiday special to my annual advent calendar. This post has been updated to add the title of the episode and the tweet with the first official image.